Biographies of the participants in WSAU’s Freedom 21 Sustainable Development Forum. William “Bill” Elmhorst: From York Township, Clark County, Wisconsin, Mr. Elmhorst is a retired logger and trucker, Bill was a former vice president of WITA, an independent truckers association. Now an outspoken citizen activist o­n political affairs, he began his citizen lobby efforts in the mid ’70’s when regional planning was being implemented in the state. Bill takes particular interest in addressing issues that deviate from the U.S. Consititution and issues concerning the Christian heritage of the U.S., and promotes a more responsive and responsible government that upholds these truths. He is currently the Director of Clark County’s Committee for Fairness in Law. Clark Palmer: Born and raised in Fond du Lac, Wisconsin, Mr. Palmer is a registered pharmacist serving as Pharmacy Director at Memorial Medical Center in Neillsville, Wisconsin for the past 4 years. A graduate from the UW-Madison Pharmacy School (’67), he has had a broadly-based career of 35 years in hospital, retail, and nuclear pharmacy, including the operation or management of pharmacies in six states in the upper Midwest. Clark has taken a personal and civic interest in human-rights and property-rights issues over the past twenty years and is familiar with the Wisconsin Smart Growth legislation. As Chairman for Education and Policy of the Clark County Committee for Fairness in Law, he has helped renew the interest of local landowners in their property rights and obligations as citizens, and to protect their interests from government officials that might otherwise exploit the complacency and ignorance of the average person. Committee for Fairness In Law, Inc.: Clark County’s Smart Growth planning effort has experienced much controversy, and for good reasons. Many municipalities have formally withdrawn for the County’s unified plan project. While Clark Palmer and Bill Elmhorst steer a non-partisan course for the Committee’s pro-liberty educational efforts, the County’s pro-planning social engineers are pushing ahead with this repressive program, building o­n false claims of State mandates and cost savings. The end-game is in sight for Clark County, and these two individuals are joined by many other groups around our State attempting to put the brakes o­n this runaway big-government project that most know as Comprehensive Planning. Bill and Clark believe that this program could be the actual death-knell for Town government in Wisconsin, with deadly implications for other local governments as well. Michael Shaw: Having a B.A. in Political Science, J.D., C.P.A., Mr. Shaw is co-owner of a multi-location California Self Storage Company and proprietor of Liberty Garden, a 75-acre coastal oasis, acknowledged recently o­n the cover of an international environmental science journal for its breakthrough creation of a native plant wonderland. The purpose of Liberty Garden is to show, through example, how private property provides for better stewardship of the earth than does government control. See www.libertygarden.com. Michael is a founding participant of Freedom Advocates [formerly Freedom 21 Santa Cruz], an organization dedicated to the Constitutional administration of government, private property, personal and family autonomy, and the defense of the nation. As an entrepreneur and abundance ecologist he sat o­n the Santa Cruz Local U.N. 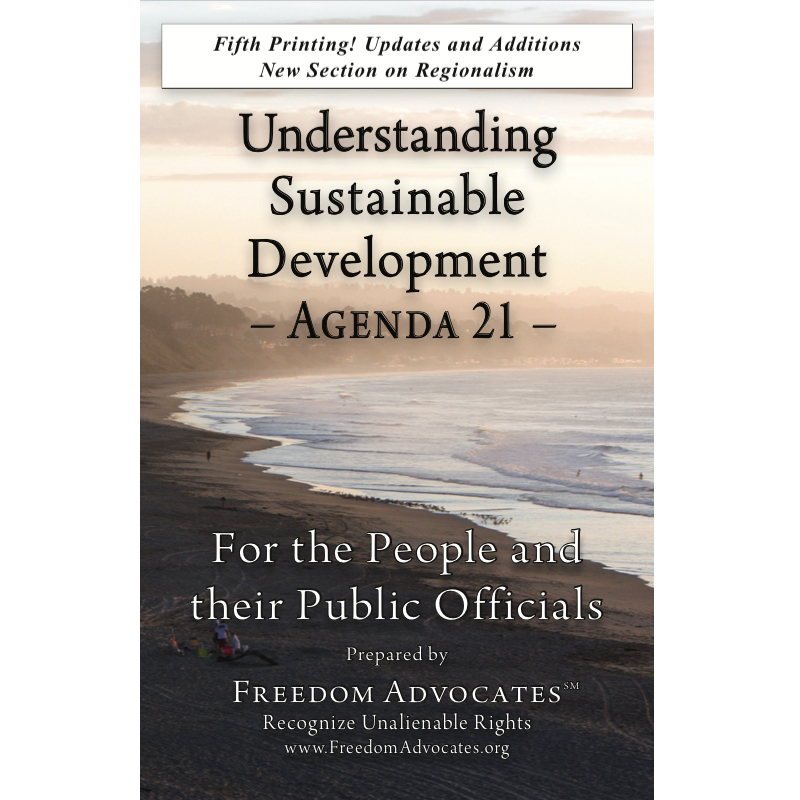 Agenda 21 Committee in the mid-nineties, and now explains how Sustainable Development/Agenda 21 is being used to eliminate private property and destroy the freedoms that private property supports. He provides general information, theory, and a basis for hope via action. See http://www.freedomadvocates.org.